Queensland parents who have been shunned by the mainstream for not vaccinating their children are fighting back. The Sunshine Coast-based Natural Immunity Community, a network of anti-vaccination families, has revealed plans to create their own childcare and homeschooling in response to the federal government's No Jab No Play regulations implemented in 2016. Network spokeswoman Allona Lahn has accused the government of insighting fear and spreading misinformation and propaganda about vaccination. 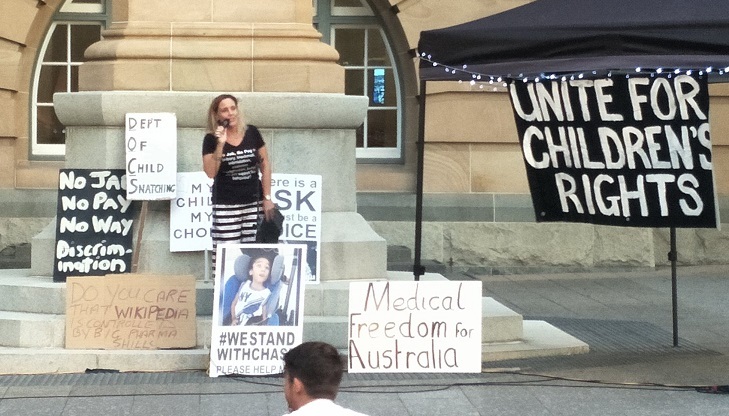 She has called for a national debate on the controversial issue and told Daily Mail Australia she thinks the anti-vaxxers would win. Under the federal policy, only parents of children who are fully immunised can received any family tax benefits and childcare rebates they are eligible for. 'We are creating alternatives as we have been forced into a corner thanks to the bullying, intimidation tactics by our government,' Ms Lahn said. 'Mothers rights' have been lost in the community so we're offering services to help and support anti-vaxxers out there.' According to Ms Lahn, Natural Immunity Community membership has skyrocketed from 18 to 800 within three years on the Sunshine Coast, where parts of the region have the lowest immunisation rates in Queensland for five-year-olds.